In MySQL 5.7, the Optimizer Team has been doing great work in refactoring as well as innovation with the new Cost Model. 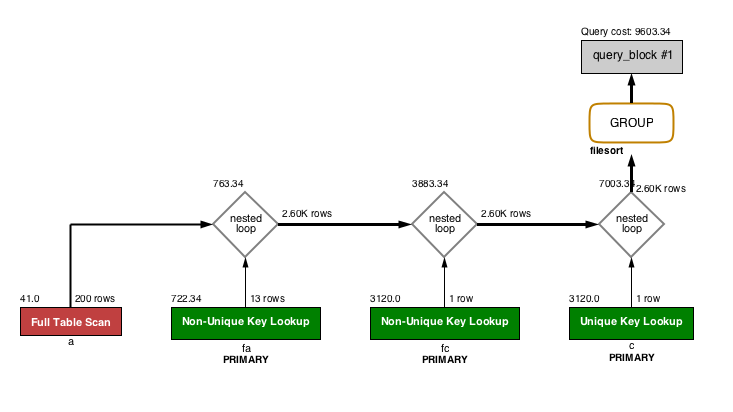 The improved Visual Explain enables the DBA to now get deeper insights into Optimizer decision making, for improved performance tuning of queries. The UI was also improved to allow easier navigation in large query plans. The query results panel was updated to centralize the many features related to result sets into a single location. Result Grid, Form Editor, Field Types, Query Stats, Execution Plan (including the traditional and Visual Explain) and the new Spatial Viewer are all easily accessible from a single interface. 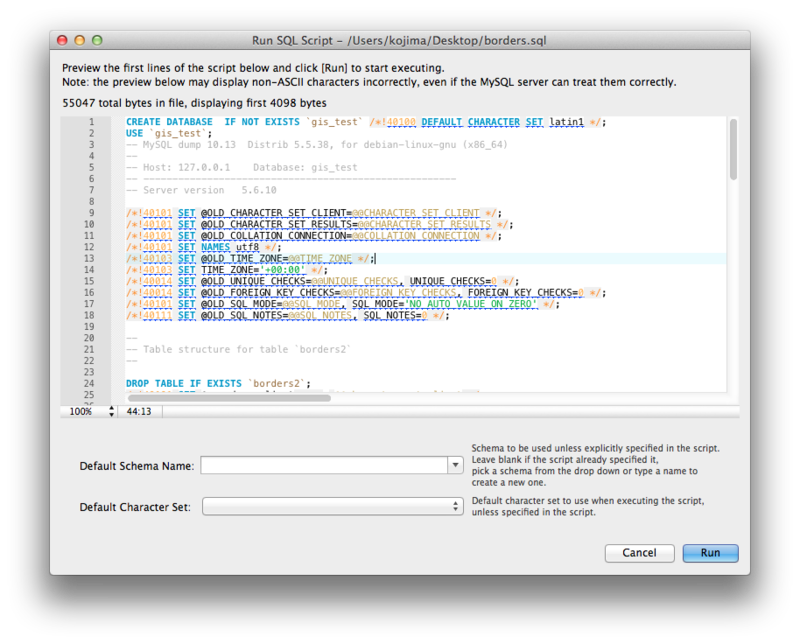 It often happens that people try to load gigantic SQL script files into the Workbench SQL editor just to execute them. That will rarely work, as loading files for editing uses a lot of memory and Workbench does a lot of processing in the editor (syntax highlighting, syntax checking, code folding etc). To execute arbitrarily large scripts easily, you can now use the dialog at File -> Run SQL Script: The dialog lets you preview a part of the script, specify a default schema (in case it’s not already defined) and a default character set to use when importing it. The output window shows warnings, messages and a nice progress bar. SQL Snippets are useful to store queries and commands that are used often, but until now they could only be stored locally. In 6.2, you can now store snippets in the MySQL server you’re connected to and anyone anywhere who can access the .mysqlworkbench schema can also use these snippets. Resultset grid columns are now automatically resized to fit – and if you manually resize a column, the customized size is remembered, so next time you run that query again, the columns will be back to the size you left them. Customize font for resultset grid – some people want to cram more text in the resultset grid, some people prefer bigger, easier to read text. 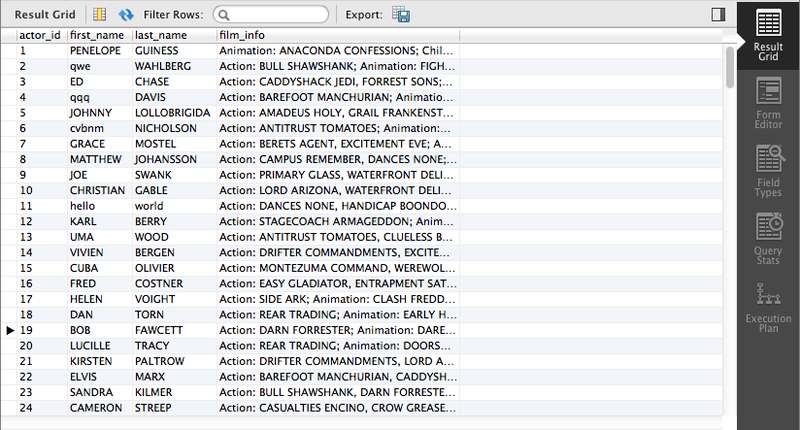 Now you can pick what you like in Preferences. Improved state saving for the SQL Editor – Opened, closed and reordered tabs are now properly saved and restored. The scroll position and cursor location is also remembered.